Introduction Tibial fixation is the weakest link in anterior cruciate ligament (ACL) reconstruction. Optimal or maximal ACL graft fixation in the tibia remains a challenging goal. Also, tibial fixation with implants for ACL reconstruction can be associated with a wide variety of problems such as graft-tunnel mismatch, graft damage, and poor graft fixation using metal or absorbable implants. Patients and methods A total of 15 male patients, average age 22.2 years (range: 18–36 years), were studied from December 2005 to December 2009. Eleven of our patients had associated medial meniscus injury. The causes of ACL injury were sport accidents in 12 patients and road traffic accidents in three patients. The right limb was affected in nine patients and the left limb was affected in six patients. Results Of the 15 patients, two patients were unwilling to or unable to return for assessment. These two patients were stable and had no complications or complaints at the sixth month for the first patient and at the ninth month for the second one. The results of these two patients were reported. but they were excluded from the evaluation, leaving 13 patients for the final assessment. The follow-up duration was 24 months. Subjectively, no patient complained of residual pain or instability and all patients were able to return to full activities as before injury before 12 months. The preoperative Lysholm Knee Score was poor, with a median of 61 (range: 7–95) as would be expected after injury. The median Lysholm Score at 24 months was 95 (range: 70–95). Objectively, all patients regained full extension and the flexion ranged from 120° to 140°. All patients had a solid end point on the Lachman test, with no positive pivot shift test. Conclusion This report describes a new technique for transosseous tibial fixation for ACL grafts of all varieties. This method secures the ACL graft to the tibial metaphyseal bone, followed by knot tying over a bone bridge and augmented with bone block impacted in the tibial tunnel. This technique is a simple, safe, inexpensive, and reproducible alternative for all types of grafts fixation in the tibial tunnel without hardware in ACL reconstruction. Tibial fixation is the weak link of reconstructed anterior cruciate ligament (ACL) and tibial fixation of the grafts (hamstring tendon grafts and bone–patellar tendon–bone grafts) remains problematic. Problems with tibial fixation result primarily from the lower bone density of the proximal tibia and the fact that tibial fixation devices must resist the shearing force applied . Common problems encountered specifically for tibial fixation in these procedures have included graft-tunnel mismatch (protruding bone block) when using a graft with bone blocks ,. Graft damage or poor graft fixation may occur with the use of interference screw, stables, and screws with washers ,,,. Scheffler et al. showed that seven of eight specimens in which a quadrupled graft (doubled semitendinosus and gracilis tendon) was anchored in the tibial tunnel with a soft threaded titanium (7×25 mm with an 8 mm head) failed with slippage of the tendon out of the tibial tunnel at a load of 300 N.
Lahav and Burks  suggest that staples used for secondary tibial fixation may cause graft necrosis and lead to early failure of the reconstruction. Painful retained hardware secondary to prominent implants and limited soft tissue coverage in this area can also be problematic ,. Tibial fixation with implants in cruciate ligament reconstruction surgery in skeletally immature individuals can be difficult or undesirable secondary to the potential for growth plate disturbances from hardware placement . We present a surgical technique that eliminates the use of a hardware for tibial fixation while securing the ACL graft to the tibial cortex in conjunction with bone block impacted in the tibial tunnel. A total of 15 male patients, average age 22.2 years (range: 18–36 years), were studied from December 2005 to December 2009. Eleven of our patients had associated medial meniscus injury. The causes of ACL injury were sport accidents in 12 patients and road traffic accidents in three patients. The right limb was affected in nine patients and the left limb was affected in six patients. A fully informed consent was taken from all of the patients. The treatment plan as well as the surgical procedure was checked and approved by the ethical committee of our institution and the international standards. This technique is a new method whereby sutures used to handle and tension the graft can be used mainly for primary graft fixation and in certain situations, the fixation can be augmented by bone graft inside the tibial tunnel. The initial part of the procedure consists of a standard knee arthroscopy evaluation, followed by standard knee anterior cruciate ligament reconstruction (ACLR). Nonabsorbable suture ends attached to the distal end of the graft augment the attached suture to the graft, and should be long enough to pass across a transosseous tunnel (TX) created immediately below the external hole of the tibial tunnel (this in the case when the graft end does not protrude from the tunnel − case 1) or (in other situations where the graft end protrudes from the tunnel − case 2). The proximal hole of the TX should be separated from the distal hole of the tibial tunnel by a distance equal in length to the length of the protruded part. All grafts are stabilized on the femoral side in a routine manner on the basis of the surgeon’s preference. The tibial fixation can then be performed using our technique as we will describe. The suture ends attached to the distal end of the graft should be separated equally into two halves and each half grasped by a small surgical instrument. To start the creation of TX in case 1, two drill holes 3.5 mm are created on the anteromedial aspect of the proximal tibial cortex. The first one is immediately below the external hole of the tibial tunnel and the second one is below it by about 2.5 cm. A small curved mosquito is used to create the tunnel between the two holes. After that, the first half of the sutures is passed from the proximal hole of the TX to the distal hole using the loop of a soft wire passed in the retrograde direction ([Figure 1]). Figure 1 Transoseous tunnel (TX). With a tension is applied to the sutures and a posterior force is applied to the proximal tibia, the knots are made for the suture ends with the knee joint in the position preferred by the surgeon. In case 2, a gutter is performed in the distance between the distal hole of the tibial tunnel and the proximal hole of the TX (usually it is equal to the distal bone block in case of the patellar tendon and in case of the hamstring tendon; if the protruded part is longer than 2 cm, we have to unwind the distal end of the graft to keep the protruded part not >2 cm) ([Figure 2]). Figure 2 Graft tunnel mismatch. The proximal hole of the TX is created in the distal part of the floor of the gutter. This to keep the distal end of the graft impacted in the gutter while tying the knots. The bone part obtained after gutter creation can be used to augment the fixation of the graft in the tibial tunnel after the knot is tensioned over a unicortical bone bridge ([Figure 3]). Figure 3 Final step and knot creation. All patients were assessed preoperatively and postoperatively for 24 months using the International Knee Documentation Committee . Ligament stability was measured by the Lachman test and the pivot shift test. The Lysholm knee score was used to document subjective symptoms . Of the 15 patients, two patients were unwilling to or unable to return for assessment. These two patients were stable and had no complications or complaints at the sixth month for the first patient and at the ninth month for the second one. The results of these two patients were reported, but they were excluded from the evaluation, leaving 13 patients for the final assessment. The follow-up was 24 months. Subjectively, no patient complained of residual pain or instability and all patients could return to full activities as before injury before 12 months. The preoperative Lysholm Knee Score was poor, with a median of 61 (range: 7–95) as would be expected after injury. The median Lysholm Score at 24 months was 95 (range: 70–95). Objectively, all patients regained the full extension and the flexion ranged from 120° to 140°. All patients had a solid end point on the Lachman test, with no positive pivot shift test. Our technique is a modified technique, based on the idea of Pasque and Garza  and that of Eisen et al. . Pasque and Garza  described a technique in which two tunnels were created directed from medial to lateral beneath the tibial tubercle and the knots were performed on the lateral aspect of the tibial tubercle. Eisen et al. described another technique in which the ACL graft was secured to the tibial cortex in conjunction with a proximal interference screw. Our technique is different from both these as it does not require another incision on the lateral side of the tibia and it does not produce any injury to the tibialis anterior muscle and also the tension applied to the graft is on the same line of the tibial tunnel. In our technique, there is no need to add an interference screw. This technique for distal fixation of the graft during ACLR precludes the need for external hardware. Furthermore, usage of this technique may represent a potential cost saving because no additional devices are used. Hardware graft fixation is an important part of successful primary or revision ACLR ,. There has been extensive literature reporting the various types of fixation and their strength properties under various loading conditions in both laboratory and clinical settings ,,. There are also reports showing the possible complications of the hardware fixation and sometimes a need for a second procedure for hardware removal ,. In revision ACLR surgery, there is the potential for previous hardware to limit the diagnostic evaluation such as magnetic resonance imaging. In addition, the hardware could be in the way of new tunnels or new fixation devices as well as cause bone or soft tissue defects when they are removed . The potential for performing this portion of the operation without hardware is thus appealing to avoid the untoward effects of the hardware . This technique provides a quick, simple, safe, and reproducible alternative for tibial fixation without hardware in primary or revision ACLR. No special equipment is necessary because the procedure is performed with instruments readily available in any operative room. It also provides an alternative means of fixation in those cases of bone block tunnel mismatch in which interference screw fixation is not possible or is compromised. Also, a small burred-out trough is made beneath the bone block to provide a flatter, less prominent bone block over the anterior medial tibia as well as to provide a larger bleeding surface for graft incorporation irrespective of the type of the graft used. Our technique is a modified technique, based on the idea of Pasque and Garza  and that of Eisen et al. . Pasque and Garza  described a technique in which two tunnels were created directed from medial to lateral beneath the tibial tubercle and the knots were performed on the lateral aspect of the tibial tubercle. 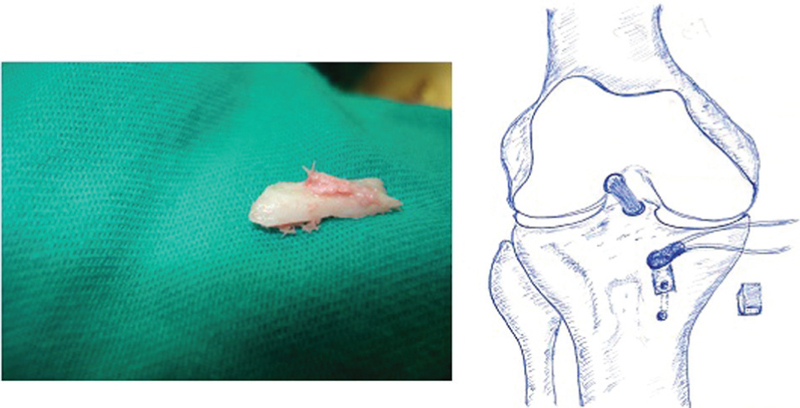 Eisen and colleagues described another technique in which the ACL graft was secured to the tibial cortex in conjunction with a proximal interference screw. Our technique is different from both these as it does not require another incision on the lateral side of the tibia and it does not produce any injury to the tibialis anterior muscle and also the tension applied to the graft is on the same line of the tibial tunnel. In our technique, there is no need to add an interference screw. Although our technique is similar to that of Pasque in that both describe how to overcome the problem of bone block mismatch, the Eisen technique fail to resolve this problem. Brand J, Weiler A, Caborn DNM, Brown CH, Johnson DL. Current concepts. Graft fixation in cruciate ligament reconstruction. Am J Sports Med 2000; 28:761–764. Pasque CB, Garza SD. Transtibial tunnel tibial fixation without hardware for anterior cruciate ligament and posterior cruciate ligament reconstruction. Arthroscopy 2004; 20:164–170. Black KP, Saunders MM, Stube KC, Moulton MJR, Jacobs CR. Effect of interference fit screw length on tibial tunnel fixation for anterior cruciate ligament reconstruction. Am J Sports Med 2000; 28:846–849. Weiler A, Peine R, Pashmineh Azar A, Abel C, Sudkamp N, Hoffman R. Tendon healing in a bone tunnel. Part I: biomechanical results after biodegradable interference fit fixation in a model of anterior cruciate ligament reconstruction in sheep. Arthroscopy 2002; 18:113–123. Pena F, Grantvedt T, Brown GA, Aune AK, Engebresten L. Comparison of failure strength between metalic and absorbable interference screws. Am J Sports Med 1996; 24:329–334. Scheffler S, Sudkamp N, Gockenjain A, Hoffmann R, Weiler A. Biomechanical comparison of hamstring and patellar tendon graft anterior cruciate ligament reconstruction technique: the impact of fixation level and fixation method under cyclic loading. Arthroscopy 2002; 18:304–315. Lahav A, Burks R. Evaluation of the failed ACL reconstruction. Sports Med Arthrosc Rev 2005; 13:8–16. Kartus J, Magnusson L, Stener S, Brandsson S, Eriksson BI, Karlsson J. Complications following anterior cruciate ligament reconstruction. A 2.5 year follow-up of 604 patients with special emphasis on anterior knee pain. Knee Surg Sports Traumatol Arthrosc 1999; 7:2–8. Lysholm J, Gillquist J. Evaluation of knee ligament surgery results with special emphasis on use of a scoring scale. Am J Sports Med 1982; 10-3:150–154. Anderson A. Rating scales. In: Fu F, Harner C, KG V, editors. Knee surgery. Baltimore, MD: Lipponcott Williams and Wilkins 1994. pp. 275–296. Eisen SH, Davidson PA, Rivenburgh DW. Supplemental tibial fixation for anterior cruciate ligament reconstruction. Arthroscopy 2008; 24:1078–1080. Beynnon B, Uh B, Johnson R, Fleming B, Renstrom P, Nichols C. The elongation behavior of anterior cruciate ligament graft in vivo. A long term follow-up study. Am J Sports Med. 2001; 29:161–166. Mologne TS, Friedman MJ. Graft options for anterior cruciate ligament reconstruction. Am J Orthop 2000; 29:845–853. Noyes FR, Barber-Westin SD. 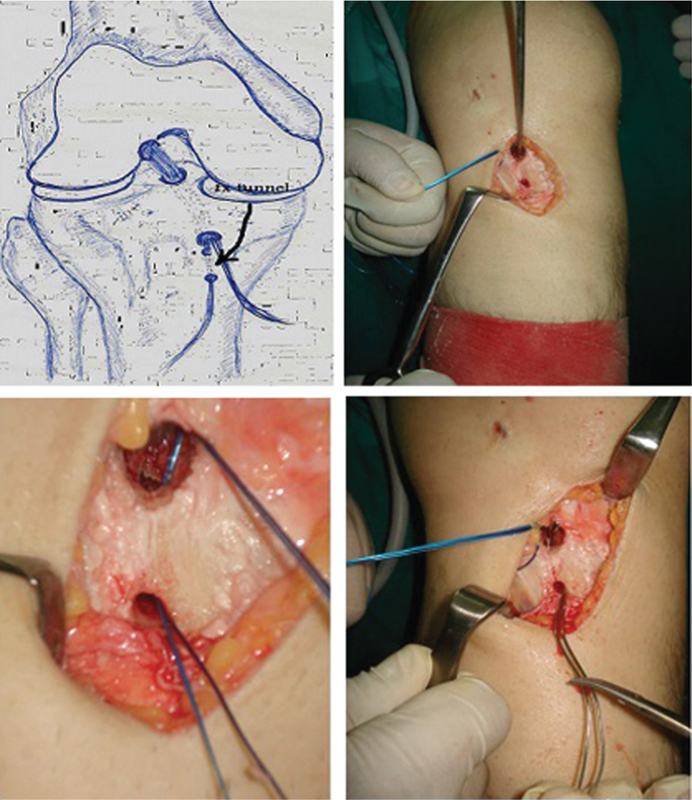 Revision anterior cruciate surgery with use of bone-patellar tendon-bone autogenous grafts. J Bone Joint Surg Am 2001; 83:1131–1143. Kartus J, Stener S, Lindhal S, Eriksson BI, Karlsson J. Ipsi or Contralateral patellar tendon graft in anterior cruciate ligament revision surgery. A comparison of two methods. Am J Sports Med 1998; 26:499–504.